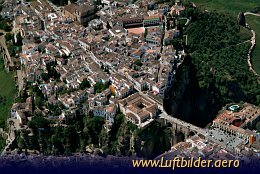 Ronda is situated in a very mountainous area 750 meters above sea level. The Rio Guadalquivir runs through the city, dividing it in two and carving out a steep canyon. Three historic bridges span the canyon.